Home | Blog | High impact costume that won’t break the bank (or your patience). High impact costume that won’t break the bank (or your patience). As any Mum of school aged children will know, this week is Book Week. And if your school is anything like the two our children go to (3 including pre school) there will be a Book Week Parade. For those who are yet to experience the fun (frustration) of the annual Book Week Parade, it is basically all the children in the school dressing up as a character from a book. At our school each year is given a different theme (think ‘action character’ for the older students or ‘animals’ for Kindergarten). Normally we get a few weeks notice however this year (probably because between my daughter and I we managed to miss the note) we found out about it last Friday. 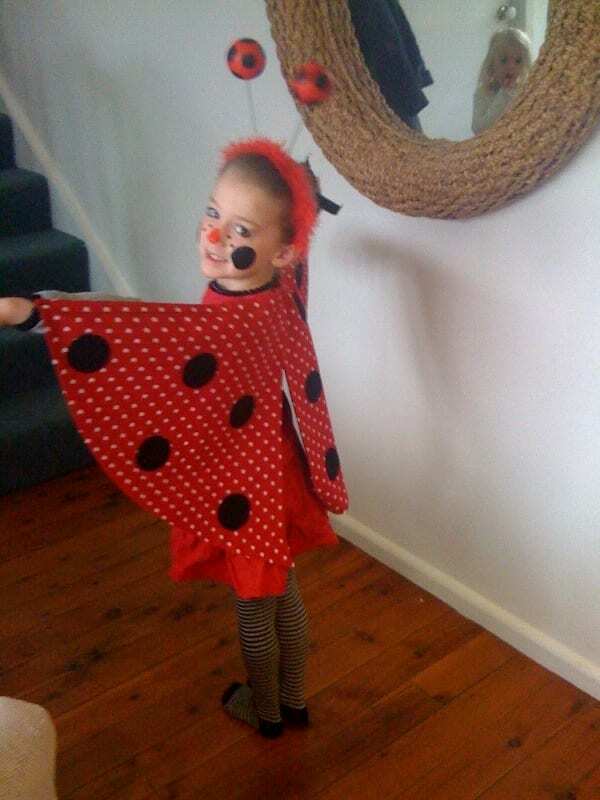 So, when little Miss just turned 6 arrived home and announced that she wanted to be a Ladybird, I thought my weekend was shot. Surprisingly it came together brilliantly and SIMPLY. So much so, I needed to share it with you so you have it up your sleeve for the future. She looked gorgeous (more importantly felt gorgeous) and it probably took me an hour all up. You can either use your sewing machine or not – totally up to you and depends on how long you’d like the costume to last. Here are some very simple instructions. Hopefully I haven’t left out any crucial bits! To attach to the red tshirt, I simply overlapped the two wings by about 2cm and then used a big nappy pin to pin them onto her tshirt at the base of her neck (where the tshirt tag is). Then I used two hair elastics at the other end of the wings which she put on her wrist so that when she ‘flapped’ her arms, her wings opened. The bottom of the wings I left to hang down. To bring it all together, we did a tight bun, added a little black necklace and I painted a few spots on her nose and cheeks. So cute. So easy, so quick and a great costume for the teacher once the parade is over (no fairy wings or lions tails to contend with in the classroom). Got any dress up tips you’d like to share? This little costume is so cute! You could even make a veriation of it into a butterfly or even a bird! You could use different coloured materials and make beautiful butterflies (they have a wide variety of colours in northern Qld) or cream coloured moths that we have a lot of that attack our vegetables we grow in our yard. Cool! This is interesting! Thank you for sharing this! Would love to see more of these ideas especially for book week! Oh what a cute and impressive idea! This costume is so cute! Thanks again; shared this costume idea with friends. Such a great idea, I had printed this out for a friend who got almost all of the same outfit for her little missy, it is sooo cute!